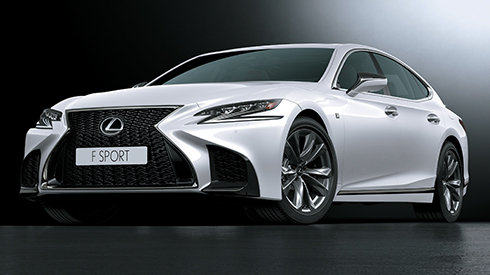 The exclusive spindle and side grilles inherit the F SPORT vertical pattern in a meticulous design that combines small L-shaped pieces. CAD modeling Takumi spent over 6 months designing the grilles to embody the outstanding power and refined elegance of a driver’s sedan while maintaining the grille’s performance. The F SPORT uses different tire sizes on the front and rear to provide exceptional handling stability and boost rear tire grip. 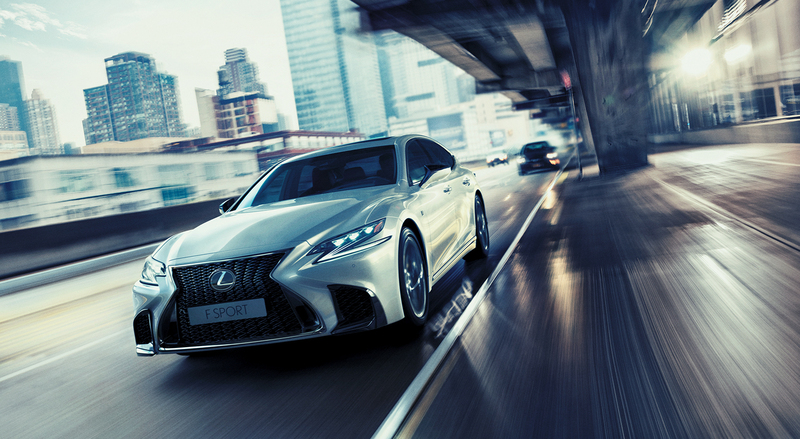 The exclusive F SPORT wheels feature a dark premium metallic paint that gives them a subdued luster, heightening the sense of excitement in anticipation of emotional driving. The front wheels are 245/45RF20 and the rear wheels are 275/40RF20 run-flat tires. Applying expertise gained in motorsports development, the seats incorporate protruding shoulder supports finished with Ultrasuede, a material with high friction resistance, to effectively hold the occupant. The perforated section of the seats features the same L-shaped pattern as the spindle grille. 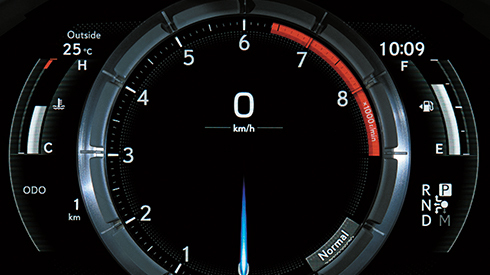 The exclusive F SPORT meter evolved from the LFA’s sliding meter ring. The advanced interface uses motion graphics that combine high visibility with beauty to display a range of functions that instantly communicate important information according to its priority. VDIM and LDH help to optimize control of six types of vehicle movement, longitudinal, vertical, lateral, yaw, roll and pitch, by controlling vertical motion using active stabilizers. 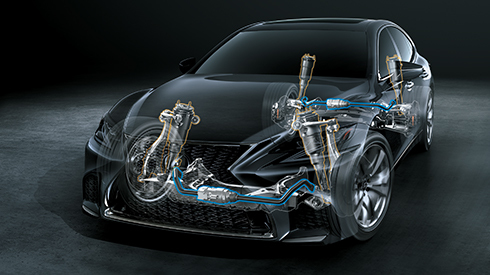 In normal driving conditions, integrated control of the active stabilizers and LDH suppresses yaw and roll, maintaining intuitive vehicle response, natural roll posture, and a stable posture across a wide range of speeds. At the limits, the integrated control extends to the active stabilizers and other systems to help assist confident and comfortable driving. In Sport S+ Mode, the system delivers pleasant vehicle response, confidence-inspiring vehicle posture and a comfortable ride. In Comfort Mode, it enhances ride comfort in the rear seats. 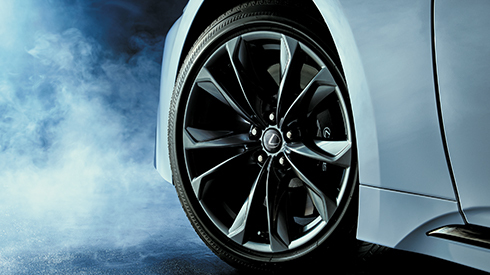 Exclusive F SPORT brakes featuring the Lexus logo consistently deliver stable braking performance to enable aggressive sporty driving. The combination of opposed 6-piston monoblock aluminum calipers on the front, opposed 4-piston monoblock aluminum calipers on the rear, and high-friction brake pads contributes to high rigidity and excellent fade resistance. 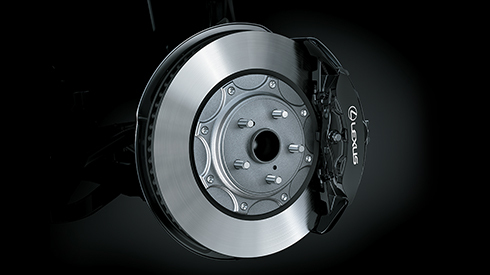 Large, 2-piece disc rotors on the front provide stable braking while limiting thermal deformation, and contribute to reducing unsprung weight.